End of year wrap parties are the climax to a filming schedule that everyone in the shows crew looks forward to. It’s the time of year that signifies the series end and as such it needs to go out with a bang. When you’re a part of the #KOMTR crew the end of year party is bound to be something out of the ordinary and straight up fun. For those who didn’t catch an episode of KOMTR, it is a comedy and male version of the Maori Television, female equivalent – ‘Ask Your Aunty’ which ran a few seasons back. However KOMTR differs in that it is a comedy panel show targeted at the male demographic and each week people send in their ‘letters’ seeking advice or help, often on strange or out there topics. Hosts Tammy Davis and Te Arahi Maipi are joined by celebrity guests who discuss these “man based issues” and the hilarity comes via the way both the hosts and guests interpret these issues. It’s saturated with a unique sense of humour and the team, an open and an “up for it” bunch of guys are quick to celebrate their achievements and in equal measure, laugh at their epic fails. And who doesn’t love a show that is able to laugh at itself? As Kiwi’s the ability to laugh at ourselves is a side effect of our DNA, we never take ourselves too seriously. 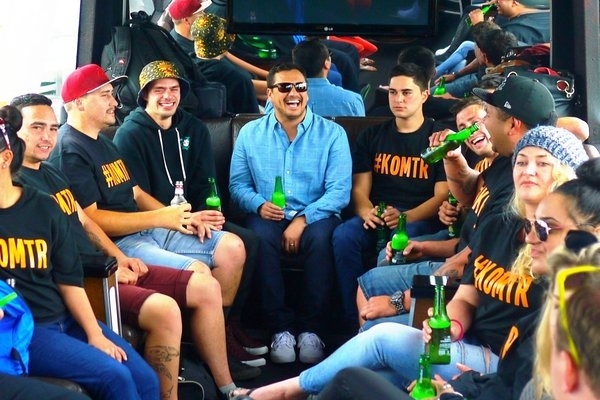 So when we had the KOMTR crew on board our Ultimate Party Bus for their wrap party, we knew an epic party was about to go down! The Ultimate Party Bus is no ordinary bus so it fit the purpose perfectly. 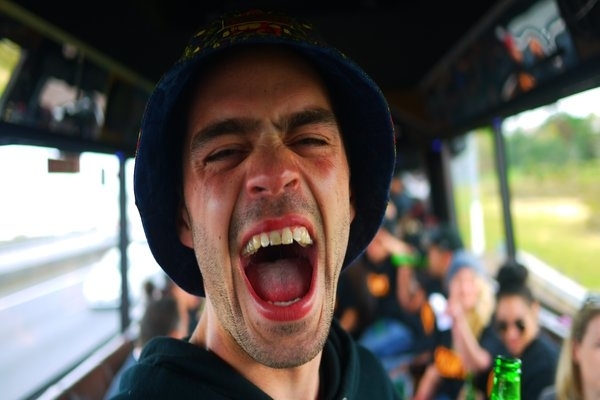 Able to hold the full crew with a 35 seater capacity, the Ultimate Party Bus oozes party fun. With sociable seating which is perfect for sharing a drink and a few laughs, alongside an awesome sound system to pump out the sounds and party lighting to really get things going – it’s hard to beat. Once on board, the crew were feeling the party vibe – this luxury transport coach never disappoints, it has everything you need to party. 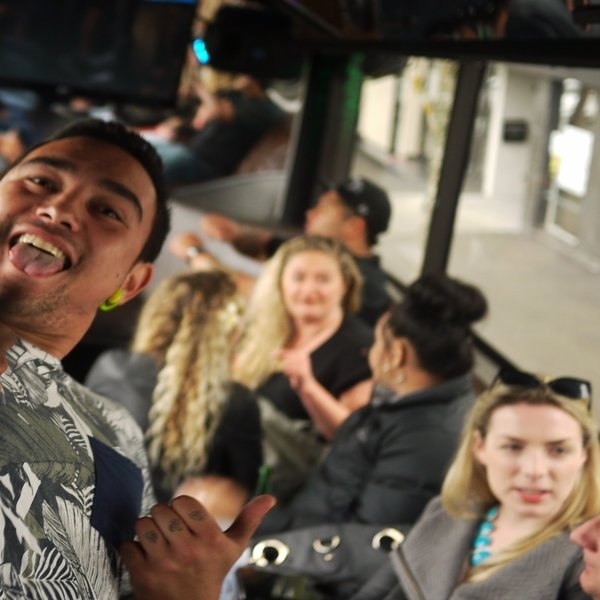 The largest limo party coach in Auckland, the Ultimate party bus gives you all the comfort of a limo with the space and seating capacity of a coach and everything onboard to ensure you have the best time ever! 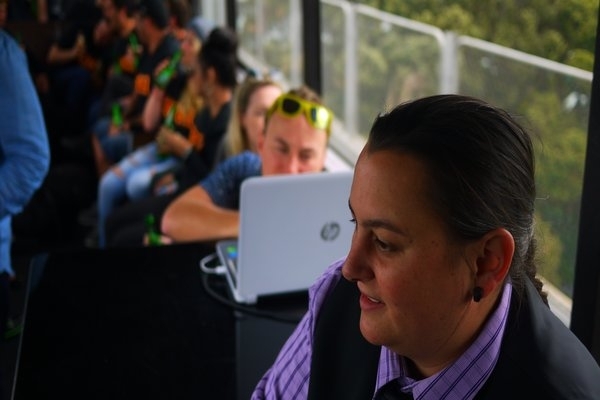 One of the best things about this Party Bus is that it has two separate lounge areas separated by the central bar area, making it the perfect vehicle to transport you from one venue to the next in fabulous style and comfort. And this worked perfectly with the KOMTR crew and their location skipping with a few stops in-between to get out and do a bit of filming – interviews and P2C (piece to camera). Perhaps what added to the all out fun nature of this wrap party is that it was not only an end of season wrap, but a series wrap. The Maori Television programming schedule for 2016 will be without the unique humour of Tammy and Te Arahi. Well at least not together and not as hosts of KOMTR. But who knows what they have planned for the New Year. Maybe it’s a case of “watch this space”. At Party Bus we love catering for unique events and love the collaboration process we get from delivering a party venue and atmosphere for groups that think outside the ordinary. We find these make the best partnerships and we love the fun filled and unique experience we are able to deliver. To have your own unique end of season wrap party or end of year office party, give our team a call and let us help you work through the details.